Be the first to share your favorite memory, photo or story of John "Jack". This memorial page is dedicated for family, friends and future generations to celebrate the life of their loved one. 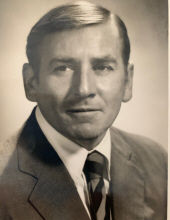 John “Jack” W. Hughes, age 92, of Stratford, died at home on Sunday, February 3, 2019. He was born on July 9, 1926 to the late James and Irene Hughes and was a lifelong resident of Stratford, as were his parents and grandparents. He was married to Mary Louise Madigan Hughes who passed June 28, 2016 after 68 wonderful years of marriage. Jack was born in an old Salt Box on Broad Street as was his father. He loved Stratford and the Housatonic River and it was forever a part of his life. He went to both Fairfield Prep and Stratford High Schools to get a degree which his mother insisted upon before he could enlist. He enlisted in 1943 and served with distinction in the US Navy aboard PT 309 in the European Theater of Operations until wars end. Upon returning to Stratford, he attended New Haven Teachers College and worked at Vought Sikorsky. He then became a Stratford school teacher and became involved in town politics with the Board of Education. Jack switched careers in 1955 and went to the newly opened Sikorsky Helicopter Plant in 1955 in the Personnel Department. He stayed with the company as it grew into United Technologies and went on to Nordens, United Aircraft and was involved with Carrier and Otis. In the later years he served as Vice President of different departments. During this time he served in the State House Legislature for two terms of district (122). That is the short version of Jack’s work career. Jack is survived by three loving children, Alexandria M. Hughes, of Sun Valley, Idaho, Jeffrey C. Hughes, of Stratford, and Britt Hughes and wife, Wendy, of Stratford; three cherished grandchildren, Willi Cannell, Isabelle Cannell, and AnNa Hughes; and several nieces and nephews. In addition to his wife and parents, he was predeceased by his son, James P. Hughes; and his brother, Robert Hughes. Friends are invited to attend a Mass of Christian Burial officiated by Rev. Rogerio Perri on Friday, March 1, 2019 at 10:30 a.m. DIRECTLY at St. James Church. All other services will be private. In lieu of flowers, contributions may be made in his memory to “Care of Our Father’s House” c/o St. James Church, 2110 Main Street, Stratford, CT 06615. Please visit www.pisteyfuneralhome.com to leave condolences online. To send flowers or a remembrance gift to the family of John "Jack" Hughes, please visit our Tribute Store. "Email Address" would like to share the life celebration of John "Jack" Hughes. Click on the "link" to go to share a favorite memory or leave a condolence message for the family.